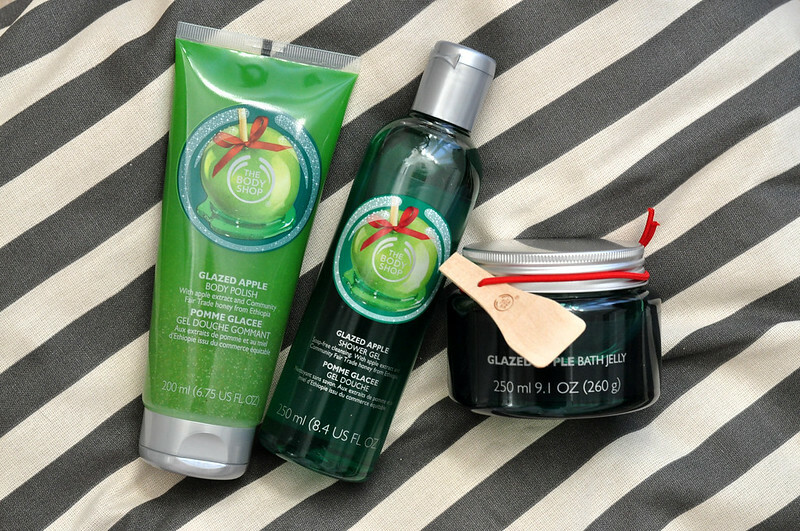 Glazed Apple Body Polish | £10 // If you've read my previous The Body Shop Body Scrub reviews then you'll know I have pretty mixed feelings about them. Some are amazing and work really well while others don't make a difference to your skin at all. This Glazed Apple one is sort of between the two. The scrub particles are quite small so I find I have to use a bit more product than normal. It's one of those that you could use on a daily basis and it wouldn't irritate your skin as it's a gentle scrub. I prefer ones that I only use once a week and they're quite abrasive, this isn't one of them. I'll use it and enjoy it but I wouldn't rush out and buy another bottle. Glazed Apple Shower Gel | £4 // This has the standard The Body Shop shower gel formula but with the amazing Glazed Apple scent. It's a fresh apple scent but with a hint of sweetness to it. It cleanses the skin nicely without stripping any moisture and lathers up well especially if you use a shower lily. I always find I need to use less product when using a shower lily which is always a bonus as it means it'll last longer. Glazed Apple Bath Jelly | £10 // This is such a unique product and isn't like anything I've tried before. When I ordered it I thought it would be a bit like the Honeymania bath soak but it's not. It feels and looks like a jelly which sort of melts when you add it to running water. It then turns into your more traditional bubble bath. The little wooden spoon is useful although it's just as easy to use your hands to get a bit of product out. Unfortunately it looks like the body scrub and shower gel aren't available to buy anymore, they must have sold out, but here's to hoping they bring this scent back as it's one of my favourites. The Jelly is still available though if you want to try the scent. I really like this scent & haven't picked anything up from this range yet so I hope they still have stock in stores.